Pine nuts are the edible seeds of pines (family Pinaceae, genus Pinus). Pine nuts seed is cylindrical and 2 to 3 centimetres long, with a dark brown outer skin, which has to be removed before eating. Pine nuts contain the highest amount of proteins, found in any nut. Pine nuts are the only source of pinoleic acid that helps in stimulating the hormones that act as appetite suppressants. This is great for those who are watching their weight or are dieting. Pine nuts are also the only nuts with highest concentration of oleic acid. Oleic acid is a mono-saturated fat that helps the liver to eliminate harmful triglycerides from the body. They are also great for heart, as they contain the same mono-saturated fats as in olive oil. They help reduce cholesterol and protect the arteries from damage, thus preventing heart attacks. Pine nuts have high antioxidants that help protect the cells from damage due to free radicals. They are power packed with iron that helps in increasing the haemoglobin level of the blood. 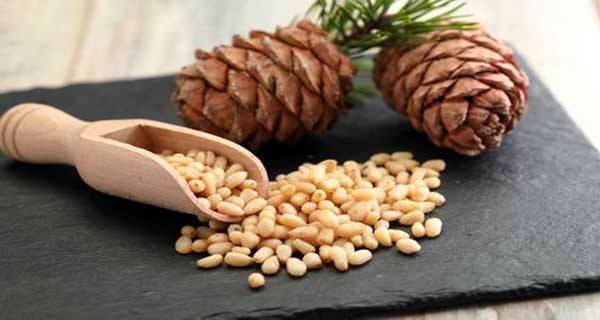 Pine nuts also contain magnesium that helps in reliving muscle cramps, fatigue and tension. Pine nuts are extracted to produce oil that is very famous for its nutty and mild flavour. In southwest America, a special coffee known as ‘Pinon’, is made from pine nuts. This is a dark roast coffee that has a deep, nutty flavour. They are regularly included in fish recipes, vegetarian recipes and meat dishes as a source of dietary fibre. So if you are trying to lose weight and need to maintain a healthy diet, do eat some pine nuts.